Can a teacher’s salary buy a home? A map of average teacher’s salary vs. the salary needed to afford a house in each state. Being a teacher is hard. Students are disrespectful, parents are demanding, and administrators are unsupportive. It’s no wonder that the teaching profession has a high rate of attrition. However, what’s less clear is if teachers are underpaid. Teachers and teacher unions of course think so. But legislators disagree. One way to think about this is mapping the average teacher’s salary vs. the salary required to buy a home. It’s not a perfect metric, but we can surely all agree that, if we expect teaching to be a full-time profession, it should at least pay enough to afford a home. 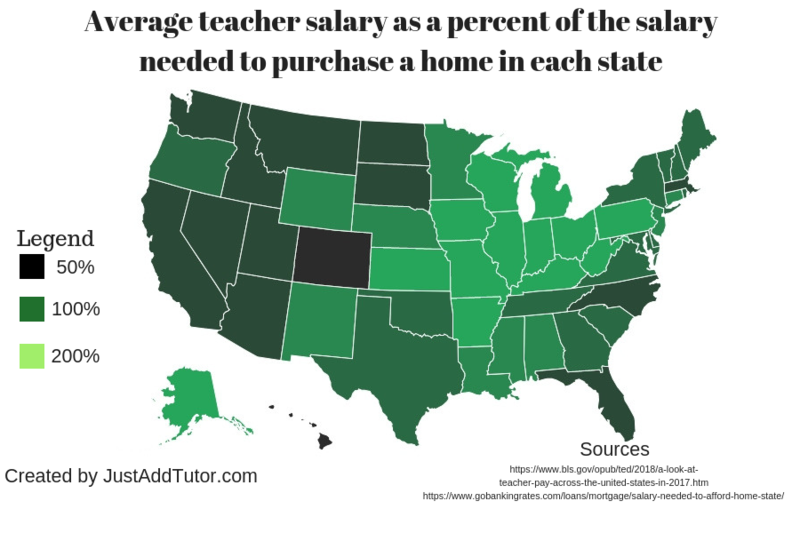 When we do we, we find that there are 11 states (plus DC) in which the average teacher does not make enough to afford the average home: Hawaii, District of Columbia, Colorado, California, Utah, Montana, Idaho, North Dakota, Arizona, Florida, and North Carolina. Looking at news stories from those states is not entirely surprising. Colorado teachers were recently marching to demand more education funding. Meanwhile, Hawaii has found itself ranked as the worst state for teachers. The other side of the spectrum isn’t that surprising either. Ohio’s teachers make twice the salary needed to afford a home, and they were ranked the 10th best state for teachers. Pennsylvania, whose teachers make just shy of twice the salary needed to buy a home, recently had their governor pledge support for their powerful union. There are hints of more complicated dynamics at play, though. Michigan, which pays its teachers very generously, is suffering a state-wide teacher shortage. It’s not so much that teachers refuse to work at the average salary of $62,910, but rather that Michigan can’t afford to hire their new teachers at that rate. Instead, they’re trying to hire new teachers at a much lower rate (e.g. $39,757 in Detroit), with predictable results. The full spreadsheet is available to view here.